Frozen food labels and packaging is one of the most diverse sectors in the labelling industry. The product sectors that make up the food industry cover a vast range of foods from chocolate to frozen veg; breakfast cereals to shellfish; pickles and sauces to organic baby food. Sub sectors such as frozen foods offer unique demands from their labelling. Brands, large and small, are looking for the ability to add value where they can – special promotions, peel & reveal labels, recipe booklets, variable data campaigns – all of which are designed to engage customers and encourage spending, in addition to improving traceability to source. All these factors have led to the trends toward shorter run lengths and a rising demand for product differentiation. Digital production of food labels continues to grow as a result. For Label Expo 2015 we chose to design and print a ‘hybrid’ label that you might see on a small batch manufacturer’s product. We printed labels for six different ice cream flavours – the background remained the same but variable data, in the form of different colours and fonts, was used to differentiate between flavours. The digital inks produce clean, vibrant colours to allow the produce to stand out, but they are also fit-for-purpose – digital inks must be extremely light resistant and perform well in scuff, scratch, low temperature and moisture testing. In addition it must be possible for the digital ink to be used in combination with all standard substrates and functional barriers such as laminates. This example of a Frozen food label shows how Graphium inks have been used to create an attractive and functional product on PE-White. This is a short run, versioned label range, which has been laminated, die-cut and then rewound. 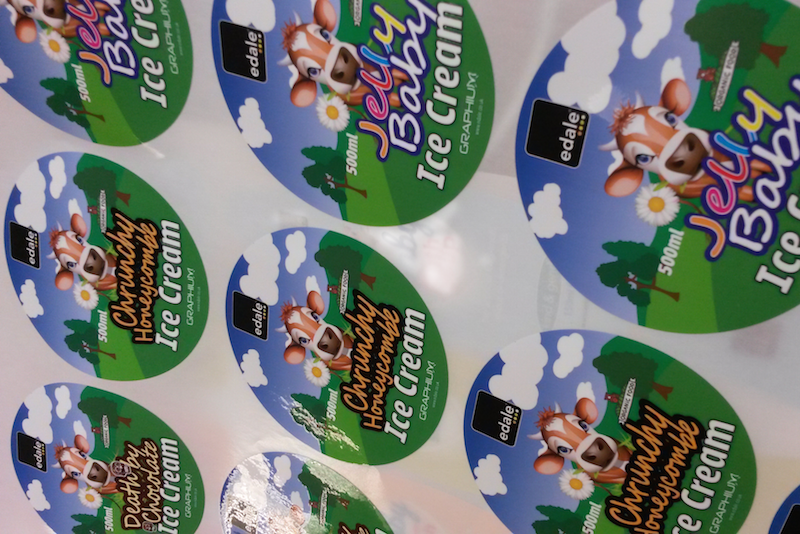 The Frozen food label example we will be running at Label Expo is for an Ice cream tub lid, printed on PE-Gloss white. Ice creams and desserts often have very vibrant colours, which draw they eye and depict the product in an appetizing manner. As label jobs go this was a pretty straightforward job to set-up and run, from both a prepress and conversion perspective. The design artwork was uploaded to Graphium Label Workflow, which automatically set-up the file and allowed the different flexo and digital output files to be created. In a single pass the Frozen food label was digitally printed and then a laminate added for an extra smooth finish but also to act as a functional barrier. Graphium label workflow can incorporate full colour variable data from both standard multipage PDF, and PDF/VT for more challenging applications. Enabling changes to any part of the design. In this case the job could be printed in several different step & repeat layouts depending on the design. We were able to demonstrate backed up runs of single labels with zero waste in between printed versions. Alternatively the job could be printed as lanes allowing a longer run of multiple labels in parallel. Finally the workflow can allow true variable data where users can support variations in a single product to support promotional campaigns. The job was printed using wide gamut CMYK. This unique colour set has one of the widest gamut’s allowing colours to be produced that many presses can only achieve with expensive 7 colour process sets. This gamut is maintained across a very wide range of substrates due to the dot spread being very precisely controlled via pinning lamps. Inter colour pinning on every colour is unique to Graphium it allows each colour to be tuned to the substrate providing the correct balance of adhesion, detail and smoothness. By pinning very close to the print head the droplet can be cured at precisely the right moment. In line with the Graphium digital print unit is a Flexo unit with tint roller and lamination bar mounted on rails. Providing inline lamination with choice of UV or aqueous adhesives. It is very important to indirect food contact to ensure that the ink is sealed by functional barrier preventing substance migration through both penetration and contact before it is rewound. Finally the label job ran through the new semi rotary die cutter, with all waste being stripped away before being rewound.